If you recently received a 1099-C, Cancellation of Debt, you may be wondering what to do with that form and how to use it when filing your income tax return. You were likely sent a 1099-C if your home went into foreclosure in 2012, you did a short sale on any property, or if a lender “forgave” any amount of mortgage debt or other debt you had. The IRS offers guidelines on how you should treat “forgiven” mortgage debt. Here are 10 things the feds want you to know about mortgage debt forgiveness. Normally when a lender forgives or cancels a mortgage debt or another type of debt, you have to pay income taxes on any forgiven amount that was due. But for mortgage debt forgiven in 2012, special exceptions exist. For starters, if the cancelled debt applied to a mortgage on your main home – not a second home or investment property – you may be eligible to exclude the cancelled debt from your income. The net result is that you typically will not owe taxes on forgiven mortgage debt when the property in question was your principal residence. To qualify for a tax break on forgiven mortgage debt, the loan you took out must have been for specific purposes: to buy, build or substantially improve your primary residence. That residence must also secure the mortgage. So note that mortgages you took out to pay off credit card debt or pay for college don’t qualify. Even though Uncle Sam is generous enough to let you walk away (via a short sale or foreclosure) without tax consequences from a primary residence that is unwanted, unaffordable or underwater, there is a limit to the government’s generosity. For the 2012 tax year, the maximum qualified mortgage debt that you can exclude under this exception is $2 million. The limit is $1 million for a married individual who files a separate tax return. Obviously these limits won’t be a problem at all for most Americans, considering that the average home price in America is less than $200,000. According to the IRS, you may also be able to exclude from income the amount of mortgage debt reduced through mortgage restructuring. So if you had a loan modification or a loan forbearance last year, and many people did use mortgage modification programs like HAMP or HARP, the amount of debt forgiven shouldn’t come back to bite you financially in 2013. Again, you are also able to exclude mortgage debt cancelled in a foreclosure. This is good news to people who’ve lost their homes for various reasons, such as unemployment, divorce or expensive medical bills. No one would want to be evicted from their residence following an economic hardship, get a 1099-C, and then wind up having to pay taxes on forgiven debt for a home in which they’re no longer even living. This tax break prevents that from happening. In order to qualify for this exclusion, the mortgage need not have been an original loan that you took out when you first bought your house. You can also qualify for the exclusion on a refinanced mortgage. As mentioned above, this tax break applies only if you actually used the funds from a refinancing to purchase, build or substantially upgrade your main home. The exclusion is capped at the amount of the old mortgage principal just before the refinancing. If you were granted loan forgiveness on a refinanced loan that you used for other purposes – like bankrolling your small business or paying medical bills – then that cancelled mortgage debt is subject to federal income taxes. If you qualify for tax relief, you need to report the excluded debt on IRS Form 982, Reduction of Tax Attributes Due to Discharge of Indebtedness. You simply submit the completed form with your 1040 federal income tax return. To reiterate IRS guidelines, other types of cancelled debt do not qualify for this special exclusion – only mortgage debt on a primary residence. So you’re out of luck in getting a tax break if you received debt forgiveness on a vacation home or business property. Likewise, the IRS taxes forgiven debt if the debt forgiveness was tied to things like credit cards or car loans. You may be able to get other tax relief for those forgiven debts, however, so be sure to read Form 982, which contains more information about specific provisions regarding forgiven debt that is non-mortgage related. If a lender was going to send you a 1099-C in the mail, you should have received it by now. Those 1099-C forms typically get distributed to taxpayers in January, although some companies might be stragglers and won’t mail you a 1099-C until mid or late February. The Form 1099-C, Cancellation of Debt, should be scrutinized to make sure it is accurate. It will indicate the specific amount of cancelled debt and should also state the fair market value of any foreclosed property. 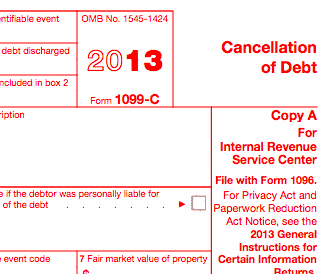 Upon review your Form 1099-C, you’ll find that the cancelled debt amount is shown in Box 2, and the market value of your home is listed in Box 7. If you spot any mistakes, it’s up to you to promptly contact the bank, lender or the issuer of the 1099-C.
Once you advise them of any errors, they should immediately correct the 1099-C form and send you a new one. When it arrives, shred the old 1099-C and then submit the updated, corrected 1099-C to the IRS along with your 1040 tax return. Q: I am the creditor and I canceled the debt (the amount owned by a real estate development company). I have provided a 1099-C to the real estate development company. Please advice what other actions I must take: (a) Do I have to inform IRS that I have forgiven debt as a creditor… if yes then how (b) How and where do I take the amount of debt as some kind of loss on my tax return, (c) what supporting documents must I attach with my tax return as an evidence that I am indeed taking a valid business loss. A: Once you’ve issued the FORM 1099-C you have done your part. In issuing the 1099-C to the client, you should of also submitted a copy of the FORM 1099-C to the IRS along with a FORM 1096. The amount of your loss is determined by whether or not you regained possession of the asset i.e. land, equipment etc. and what is the fair market value asset in comparison the the debt cancelled. Where to report the loss is determined by what entity is filing the tax return ie. Individual or Business. Be sure to advise your CPA. I refinanced under threat of foreclosure and was issued a 1099-C without Box r checked Do I owe tax?